I’m the Director of Music at St. John’s Episcopal Church who started piano and violin lessons at age six. Early accomplishments included performances of Bach and Vivaldi in elementary school. Continuing with instrumental and keyboard lessons throughout middle and high school, Glenn went on to Oberlin College and Conservatory where he majored in English Literature. Classes in the Conservatory included choral performance, music history and ethnomusicology. Glenn was a member and business manager of the Oberlin College Choir which performed at Carnegie Hall and the Kennedy Center for the Performing Arts as part of the Sesquicentennial tour in 1983. After Oberlin, Glenn renewed his keyboard studies with Jan Van Otterloo, former Dean of the Southwest Florida Chapter of the American Guild of Organists. He has performed works of Buxtehude, Mendelssohn, Vierne and Bach at the annual AGO member’s recital at ARTIS Naples. 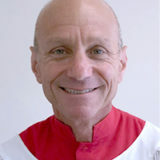 Glenn has served in various churches in the area, beginning at St. John’s as Organist and Choirmaster in 2001 and Director of Music in 2006. Continuing education has included attendance at the annual Choirmasters Conference held at St. Thomas Church in New York City.